Kuwait is an Arab Emirate nestled in the Persian Gulf’s northwestern coast, flanked by Saudi Arabia on its south and Iraq on its north and west. Kuwait State’s largest city and the capital is Kuwait City – a city where tourist attractions are in abundance. Among Kuwait’s key landmarks is the popular amusement park by the name ‘Al-Madina Al-Tarfihiya’ – the City of Entertainment also known as Entertainment City of Kuwait. 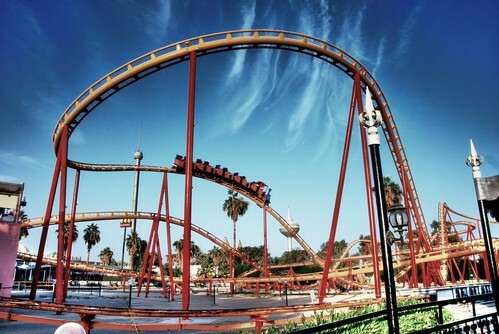 This amusement park is managed and operated by Kuwait Touristic Enterprises Company (KTEC) and is located in Al-Doha (Doha District), only 20 kilometers from the bustling Kuwait City. Spanned in an area of one million square meters, you will discover a world of entertainment, games and engaging activities in this park, at its 3 main themes namely – ‘Arab World’, ‘International World’ and ‘Future World’, catering to the taste of everyone from kids to adults, alike. At the Arab World you can enjoy boat rides in Gulf Sailing Boats and explore themed areas such as Sinbad the Sailor. While at the International World there are even more fun rides awaiting your arrival, such as African Boats, European Cars and even Australian Gondolas. Moreover there is also a Cowboys’ Arena among its other attractions. The Future World is teeming with thrilling games in line with technological advancement of the world. These exciting themed games include – The Massive (Mixer) Game, The Desert Storm, The Arcade Gym Games as well as The Space Dome. Launched in 1984, the Entertainment City is renowned as one of the best amusement parks in the world, where its visitors have the benefit of obtaining an all-inclusive ticket that entitles them to relish all these amusement activities within its premises, with no extra charge. What’s more Entertainment City also houses a charming garden called The Provincial Garden, where you can find a Roman style open theater and a mosque in addition to games such as Wireless Operated Boats, The Invaders and Flying Eagle. And you will be even more delighted to find numerous restaurants positioned around the Entertainment City, for a fine range of refreshments. If you are considering spending your holiday at a Kuwait hotel, there are many including Al-Jahra Copthorne Hotel & Resort Kuwait, offering various services and amenities to suit any budget, tastes and requirements. While staying at a Kuwait hotel you can conveniently visit the city’s many attractions including Entertainment City, where your family can take pleasure in exciting activities to no end.